The Garrard model 50 has the facility to play records automatically or can be used manually to play single records. The turntable features a large diameter steel platter and diecast aluminium pickup arm with fixed counterbalance weight. The unit is supplied fitted with either a two or four pole induction motor. Up to eight mixed records can be played automatically, of 7", 10" or 12" diameter. 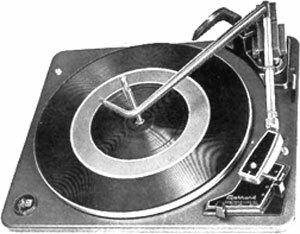 A short manual spindle is supplied for single record play and large centre hole records may be played automatically using adaptor LRS20 (optional extra). Garrard 50 / 50 owners manual, service manuals and schematics are for reference only and the Vinyl Engine bears no responsibility for errors or other inaccuracies. The PDF files are provided under strict licence. Reproduction without prior permission or for financial gain is strictly prohibited. This website is not affiliated with or sponsored by Garrard. Posted Fri, 04/30/2010 - 15:16 by lungpreest. My Garrard model 50 has no sound but the speaker works. does the pre amp have a fault? and do i have to change the capacitors? if so what capacitors do i need to get?